Nicole Richie's House of Harlow designs have become a big hit in the celebrity and television world. The latest spotting of House of Harlow is on an episode of The City from Season two. The House of Harlow 1960 starburst ring makes an appearance on The City during a party thrown by Elle Magazine, A guest at the Elle party wore the ring designed by Nicole Richie. 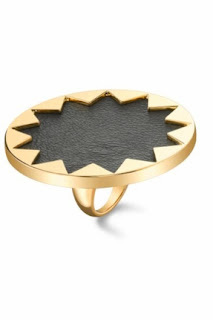 The statement cocktail ring is also a favourite of Kim Kardashian, Christina Aguilera, Dannii Minogue, Kelly Ripa, Katie Cassidy and Nicole Richie herself. Thanks to Sabine for this spotting!